This book gives you a novel insight into hyper mania. It ena .. This book gives a positive insight into hypermania, a condition which many of us suffer or enjoy but very few of us recognise. Until now! As much a self-help business management book as a book on mental health 'Hyper Mania Revealed' does exactly what it says on the tin - ie. it introduces and describes the characteristics of this wide-spread condition. 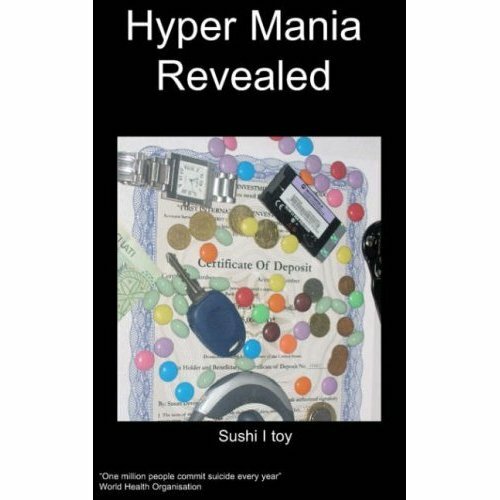 The book gives factual and medical information about hyper mania and provides personal accounts of hyper-maniacs, thus enabling more people to understand this condition. This book stresses the beneficial characteristics of a being hyper manic and describes how this can actually improve some aspects of your life. Extremely informative and original, this is a must read for anybody looking for reasoning behind the way they behave. Sushi I Toy is a progressive thinker living near London. Sushi has recognised that he has suffered from hyper mania from the age of 13. He is an enigmatic man who does not need the limelight. A regular traveller across Europe, Sushi holds some very important directorships in the SME market. He loves work and is often found on the phone (his mobile company love him!). He likes to think and ponder, he, however hates fools. His path in life is direct, he knows what he has to do. Sushi I Toy is currently working with three hyper maniacs, he' however still has time for his family and loved ones. Sushi is currently working on his second book entitled ‘Hyper Mania Explained’. Read 'Hyper Mania Revealed' - you could be just like him! The hypers will undermine by quoting facts, which are the key defence and act like mud (slowing down) because the opposition will not expect it. They will then talk to each advisor to win them over, rather than a frontal assault on a group.